Lake Bunyonyi Rock Resort offers guided golden monkey trekking tours to Mgahinga gorilla national park. A close encounter with golden monkeys in the jungle is an exceptional experience that la for a lifetime. Also known as Cercopithecus Kandti, golden monkeys are one of the critically endangered species in the world that only exist in Uganda’s Mgahinga gorilla national park and Volcanoes national park in Rwanda. Its only in these two destination that travelers have a chance to meet face to face and up close with golden monkeys in their natural habitats. The lively character of golden monkeys makes them exciting creatures to be around. The golden fur at the back of these species make them distinct from other monkey species. Similarly, travelers to Mgahinga forest can do 4 hours golden monkey habituation, which allow them spend extended time with these endangered species. Golden monkey trekking is mostly done as complement to gorilla trekking to make a complete Uganda tour package to Mgahinga gorilla national park. Golden monkey trekking is preceded by a short briefing at the national park head quarters about the trekking rules and regulation for the safety of travelers and the endangered golden monkeys. How much is golden monkey trekking? Wondering how much it is to trek golden monkeys? No worriers, the endangered species are seen at only $100, which is reasonably cheap compared to $600 for gorilla trekking. Every traveler must have a valid golden monkey trekking permit before he/she is allowed to see these primates. Interestingly last minute travelers are allowed to pay for the golden monkey permits on the day of trekking. You can book for golden monkey permits direct with Uganda Wildlife Authority or through Engagi safari experiences your best travel operators in Uganda and Rwanda. The golden monkey permit also include park entrance fee, and ranger guide who leads you through the jungle. Upon meeting golden monkeys, travelers spend an hour with golden monkeys. However, the actual time to spend in the jungle before meeting golden monkeys is not specific. This can be as short as 30 minutes to several hours depending on the location of these monkeys and their speed of movements. Like in gorilla trekking, travelers are reminded to keep a distance of seven meters away from golden monkeys. Also, any traveler with any kind of sickness is not allowed to take part in golden monkey trekking. This is to prevent the spread of human wildlife diseases. Regarding the age limit, travelers aged below 15 years are not allowed to trek golden monkeys. The reason for age limit is to save infants from dangerous forest life. Travelers are also reminded to hold their cameras tight since golden monkeys are jumpy animals which can scare at some times. YES, you need to have packed essentials for you golden monkey trekking to be successful. Remember it’s a hike through the tropical rain forest, which can be challenging especially in the rain seasons. Among the things you must park include hiking boot, gardening gloves, sunglasses, huts and rain jackets. Also remember to carry enough water and some energy snacks to keep you strong. Unlike in gorilla trekking where a number of travelers is limited to 8 people per gorilla family, there is no limit in golden monkey trekking. If you are travelling as a group, you will not be separated. You all go at once to meet these amazing creatures, which make your experience more enjoyable. In general, golden monkey trekking is a not miss for every traveler to Mgahinga gorilla national park. 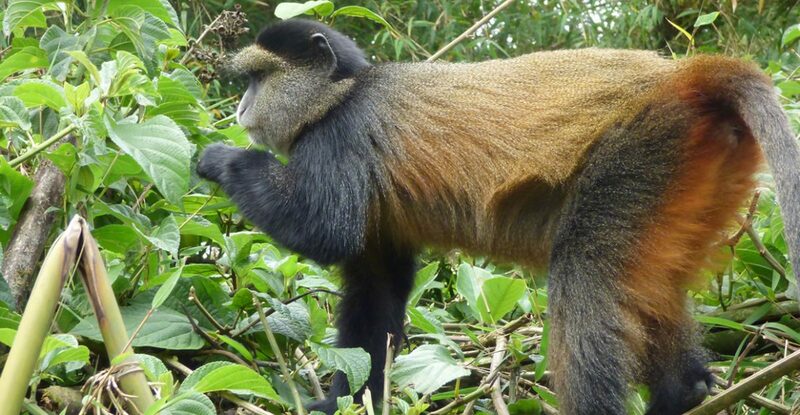 Stay at lake Bunyonyi Rock resort, visit the golden monkeys and enjoy this memorable experience with the amazing creatures.